Oh and is there any tutorial on how to use RMG Template Editor? I really have no idea how to use it despite trying to make something work for 5 hours. I do know how to handle the templates itself, I just don't know how to set them up so I can actually try them out and play them. First you should learn what is RMG and know all mechanics behind standard H3 RMGs. It's handy tutorial how to create rmgs before RMG Template Editor in polish. When you do it, I think that HotA's RMG Template Editor will be easy and understandable for you. Edited by phoenix4ever at 18:21, 04 Jan 2018. Hi guys. Since my computer is being repaired, I have'nt had the chance to try out 1.5.0 yet, so I would like to hear your impressions of it. What do you especially like? and what don't you like? Also the new spell research system, how does it work? And don't you have to go back visiting the Mage Guild to learn spells anymore? Does Cove seem fairly balanced now? I'm also curious about AI, seems it was improved according to the changelog. I would love if it's become a better opponent. Hope you would like to share your impressions, thanks. There's an option in preferences for the map editor called "arena". What is this? Edited by Sav at 21:20, 04 Jan 2018. This option can make the "one battle" maps more convenient. It is currently undocumented feature, and I won't describe it now. You can try to use it, if it is interesting for you. This option can make the "one battle" maps more convenient. It is currently undocumented feature, and I won't describe it now. You can try to use it, if it is interesting for your. Sounds interesting. I'll try to check it out. Thank you. Edited by Gruk_ at 21:46, 04 Jan 2018. Yep, in neutral zones, there is currently no way to set town types, terrain, and dwelling faction according to a player's starting town. - neutral towns can have same type as starting towns by checking "all towns/castles have same type"
- terrain can be same as town by checking "terrain > match to town"
- dwellings will have same type as starting town unless you check "Dwellings/creature reward : only neutral"
So to be able to create fair maps, I think a minimum count is necessary, don't you agree? Hi there heroes community! I have one question, how can i set a very dense terrain on my own template with RMG Template editor, if possible? Yes. All you have to do is increase treasure density. I do know how to handle the templates itself, I just don't know how to set them up so I can actually try them out and play them. Edited by blob2 at 23:17, 04 Jan 2018. Edited by Galaad at 00:23, 05 Jan 2018. Edit: OMG strike and stay option!! Does anybody have a detailed explanation of how magic research works? And an image of the new button in combat? I really with HotA would stop trying to be moral police of how people should play the game by nerfing original game features or outright removing/banning them. It's fine to change the stats of your own stuff like Cove units, but if someone doesn't like that Galthran exists or that town portal is a spell, that's their personal problem and they should modify their own maps or just not use them instead of changing HotA so that you can only play the mod and get the new content if you also submit to having original game content removed or severely nerfed. Edited by Popcioslav at 06:07, 05 Jan 2018. If you click on one of the spells you can see this pop out and for the price depending on each spell on mage guild level you can change it into one of the two new spells, either finishing the research instantly or not. If you don't finish the research instantly the globe will glow and showcase said new spell. Oh and thanks to everyone helping me understand how the RMG template editor works, I think I get it now. A little observation: Highlands have too many waterfall objects, which look odd on random maps. So does that mean you can eventually learn all spells from a Mage Guild, if you have enough ressources? No, you can't keep researching. Only once per spell slot. Which means you can at most learn double the number of spells offered, just like when you have two Mage Guilds from two towns. Edited by phoenix4ever at 09:31, 05 Jan 2018. Okay that's a bit more reasonable, but won't all players end up with the same spells then? Slow/Haste, Blind, Resurrection/Animate Dead, Town Portal, Fly and Dimension Door. I like the random element of not always getting perfect spells, won't this make everything too easy and ruin the point of Scholar and Eagle Eye? Does the AI even know how to take advantage of this system? HotA is going for making random maps suitable for multi. Just deal with it. In perfect multiplayer mode all players have the same builds, only tactic skills matter. Nobody likes Eagle Eye during playing multi So, if you want more randomeness in the game - solution is playing custom maps or playing maps with ERA/MoP/Myth/GoL addons. Making everything "the same" is just boring to me. I agree things should be balanced, very balanced in fact, but there should still be an element of luck involved. What is next step?, removing everything that has to do with morale or luck? Edited by Sav at 10:22, 05 Jan 2018. 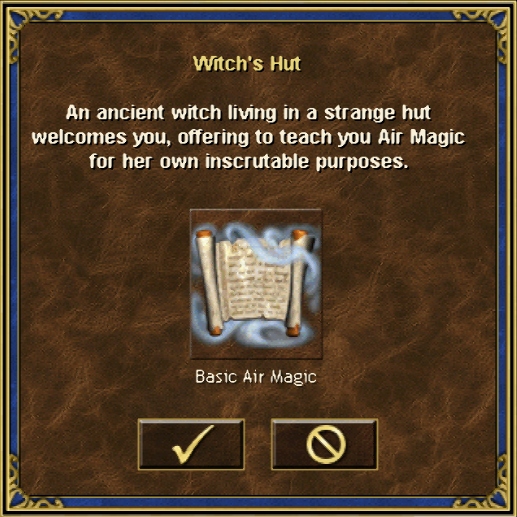 There are many simpler ways to get all the spells needed: tomes of magic, Spellbinder's Hat, Pandora's Boxes, Spell Scrolls. It is not usual case to not get something (the most important: Dimension Door and Town Portal) from it, but in multiplayer this case is usually loss without a chance. Spell research provides a very expensive way to prevent it. It also returns deeper town building and the value of such elements as resources and mines to multiplayer. In singleplayer you can just reload map many times before getting everything needed in Mage Guild without new mechanics. This mechanic can be enabled/disabled for every town in map editor or enabled/disabled for the whole template in the template editor. So, map or template creator can decide, if he needs it. It also doesn't give the restricted spells (for town, or town type, or map) and doesn't allow changing town obligatory spells. Eagle Eye is ruined with or without this system. Scholar remains useful for sure. Yes, AI uses this system to obtain the most powerful spells it doesn't have in its towns. Okay thanks for the answer Sav. As I have'nt actually tried it, perhaps I'm just overly concerned. Perhaps it's good for multiplayer, but I'm happy it can be turned off though. Anyone else having problems with the template files in Win10? Weirdest thing, I save the rmg.txt in a new folder under templates. But it doesnt show up in windows explorer, at all. It's like it's not there. But when I then try to open it again through the RMG editor it's magically there again. I tried check disk and reboot. But nothing. Anyone? Edited by Sav at 17:13, 05 Jan 2018. Maybe you placed it just in "HotA_RmgTemplates" folder, not in "HotA_RmgTemplates/[Template name]"?